Fei Teng Yu Xiang (沸腾鱼乡, Seething Fish Village) was set up 10 years ago and is one of the restaurants that made spicy, water-boiled fish popular in Beijing. 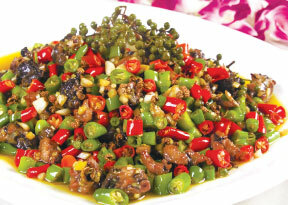 The dish combines freshly boiled fish with chili, fresh Chinese prickly ash seed, and seething hot salad oil. The fish is laid on bean sprout and is super tender, smooth and savory. To mark its 10th anniversary, the restaurant introduces 10 new dishes, all from the mountainous countryside of Sichuan. Three of these have steamed meat with ground rice: Steamed pork ribs with lotus leaf (荷叶蒸仔排), steamed frog with lotus leaf (荷叶蒸娃仔), and steamed taro, sweet potato and long beans (粉蒸三宝). Fried green pepper and chili with black-skin chicken (花椒乌皮仔鸡) uses chicken transported from Chongqing, reputed for its "real chicken flavor", unlike what is commonly found in Beijing. Another must-try is longnose catfish, steamed with salty and spicy sauce (渣海椒蒸江团). The eatery is also famous for spicy and fragrant crabs (香辣蟹), and spicy pork foot (香辣蹄). For starters, try the northern Sichuanese spicy starch noodles (川北凉粉). For vegetables, go for the tasty dry-pot baby cabbage, which is a winner when combined with steamed rice. The dcor is simple and the place is always busy. The only drawback is that most of the best dishes are spicy. Average bill is 50 yuan per person.